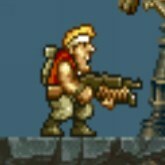 Description: Metal Slug is a great Contra style arcade platformer with tons of action. Play as Marco Rossi from Peregrine Falcon squad on a mission to take out terrorist forces, and supernatural threats. There is a total of six levels to play through with 1 boss at the end of each level. Marco is armed with whatever gun power up is a available. You can obtain machine guns, shot guns, rocket launchers, and my personal favorite the flame thrower. Lobbing tons of grenades is also very effective against heavy machinery, like tanks or helicopters. Overall this is my favorite Neo Geo arcade game available. Game Controls: Shift Key = In-cert Coin. Enter Key = Start. Arrow Keys = Move. "Z" Key = Throw Bomb. "X" Key = Shoot. "C" Key = Jump. See In-game Controls for more options.